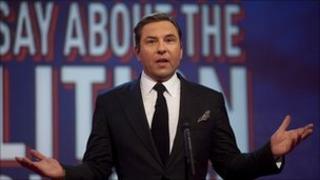 Comedian David Walliams has finished the UK's first live 24-hour panel show, in aid of Comic Relief. Walliams was joined by several celebrity guests during the online streamed show, including David Tennant, Barbara Windsor and Stephen Fry. 24 Hour Panel People saw Walliams participate in some of TV's most iconic panel shows. "It was tough, yes, but it was the right side of tough," the 39-year-old Little Britain star said. Speaking afterwards, he added: "It does take its toll on you physically with things like your eyes not being able to focus so well anymore on the autocue. "It was tough, yes, but it was the right side of tough. I mean if I was slumped on the desk not saying anything I think it really wouldn't have been very entertaining but you could see I was a little bit delirious towards the end." The comic said the first thing he was going to do was have a shower as he had not had time to wash during his brief five minute breaks. In 2006 Walliams swam the English Channel for the Sport Relief charity, eventually raising more than £1m after training for nine months. Comparing the two events, he said: "I trained for a long time to swim the Channel so I was kind of ready to do that. "With this I had a lot less sense of how it was going to work out because I really didn't know how I would be after staying awake for so long and also being on TV and trying to be entertaining - it is so different." Walliams switched between the roles of team captain, panellist and host across the day, participating in shows such as Never Mind The Buzzcocks, Have I Got News For You and Would I Lie To You?